Speaker bypass provides a combo amp with a convenient head-style speaker out. Useful for recording sessions where the player works in the control room while the cabinet is isolated and miked in another room or booth. Plugging an external speaker cabinet into the bypass jack completely bypasses the amp's normal output (from the output transformer) to the internal speaker, rerouting the output to the external speaker cab (the internal speaker is effectively disconnected). 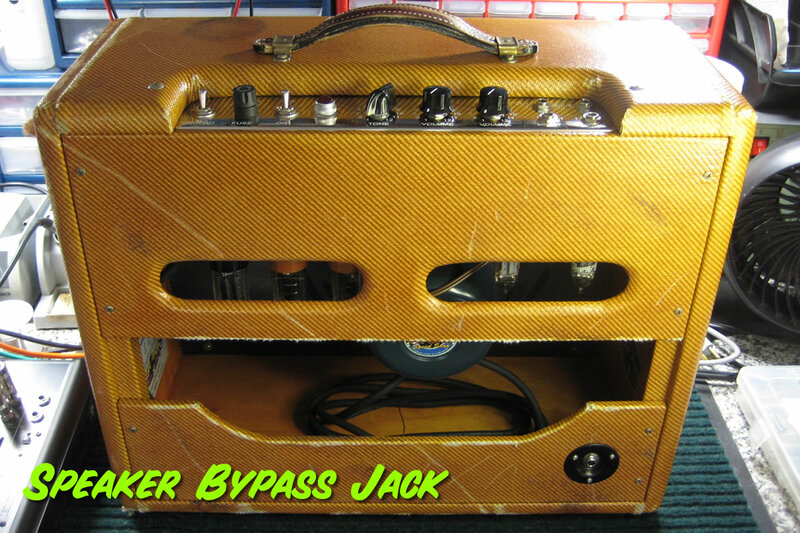 When nothing is plugged into the bypass jack the amp's internal speaker operates normally. All speed shop 5E3 Combos feature 8 ohm outputs, so the same impedance should be observed using external speaker cabinets with this combo speaker-bypass option. Speaker bypass is available on all combo amplifiers for an upcharge of $100.